Epitalon is one of the very few substances which are able to activate Telomerase (telomere terminal transferase) enzyme in humans. Telomerase renews (elongates) the telomeres, which are responsible for protection of the human DNA from damage and cancer causing errors. Treatment of aging cells in culture with Epithalon induced elongation of telomeres to the size comparable to their length during the early cell divisions. Epitalon treated cells with elongated telomeres made 10 extra divisions (44 passages) in comparison with the control and continued dividing. Thus, Epithalon prolonged the vital cycle of normal human cells due to overcoming the Heyflick cell division limit. Epitalon decreases the age-related changes in immune and neuroendocrine systems, reduces the incidence of recurrent infections and chronic diseases. Long term clinical trials have shown that in patients with age-related pathology Epithalamin eliminates imbalance in prooxidation and antioxidation systems. Results of 12-months treatment with Epithalon in patients with signs of accelerated aging showed normalizing effect on metabolism and condition of various functional systems. Elevated uric acid, alkaline phosphatase and cholesterol in elder patients returned to normal after 10 days of treatment, and remained stable in a several months peroid afterwards. There have been no reported side effects of Epithalon in any of the clinical and experimental trials. Likewise there are no reports of any Epithalamin adverse reactions on various internet forums, where people have been documenting repeated courses every 10-15 days for several years. Dosage depends on the purpose and severity of the damage which is treated. Epitalon can be used orally (less effective and large dose) or injected intramuscularly or under the skin (more effective at much smaller dose). Each 10 - 20 days course of Epithalamin is followed by 4-6 months pause before repeating the course again. Epitalon treatment can be repeated indefintely. 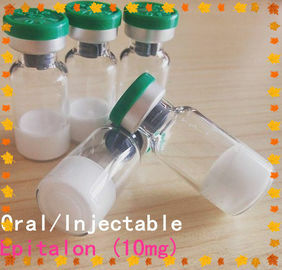 Plain sterile water for injection is the most suitable diluent for freeze dried Epithalamin (Epitalon). Alternatively it can also be reconstituted with bacteriostatic water (0.9% sodium chloride), normal saline (0.9% NaCl) or water containing 0.9% (9 mg/mL) of benzyl alcohol. It all works the same, but you probably want to use the least amount of aditives in the water - therefore plain sterile water. Lyophilized (freeze dried) Epitalon usually comes in 10 mg vials. Gently inject 1 to 2 ml of water into the vial. Let it sit in refrigerator for 10 - 15 minutes. If there are any undissolved particles left after 15 minutes, gently rotate the vial between your fingers until all of the powder has dissolved and you are left with clear liquid. Epithalon has a systemic effect regardless of the injection spot. It can be injected subcutaneously (under the skin) or intramuscularly (into the muscle). People usually inject it into the shoulder, tigh, buttocks or under the skin in the stomach fat area. If possible, always store both the freeze dried powder and the mixed solution in refrigerator (do not freeze). liquid Epithalamin should be refrigerated between 2 - 8 degrees celsius (36 - 46 Fahrenheit) at all times. It should not be frozen.